As our venture into aquaponics grows, it becomes easier to clean and maintain my fish tanks which hold breed stock before they are added to the aquaponics system. I hold fish in a 55 gallon and 30 gallon tank until they become at least 3-4 inches in length. This size seems to work out well when they are added into the population of aquaponics tank. They can better defend themselves from the bigger bullies. Since I have sold a few hundred fish to newbies just starting out, I get a lot of questions about equipment and maintenance. One of the most important pieces of equipment in a breeder tank is the filter system. I use the fluval 6 series canister models ( I have a couple of the 206 and one 306 model) as these seem to give me the best bang for the buck, with the least amount of time for maintenance. Keeping these models clean with active bacteria growth is paramount to maintaining a healthy environment for my blue tilapia. These models keep my water crystal clear, even if my tanks are over-stocked. I can normally get between 3 and 4 weeks of tank filtration between cleanings. As a note, there are other good canister filters out there and many will have the similar set-ups, but the important steps are essentially the same. Through trial and error, here are some key points to maintaining a long running filtration canister for your breeding tanks. 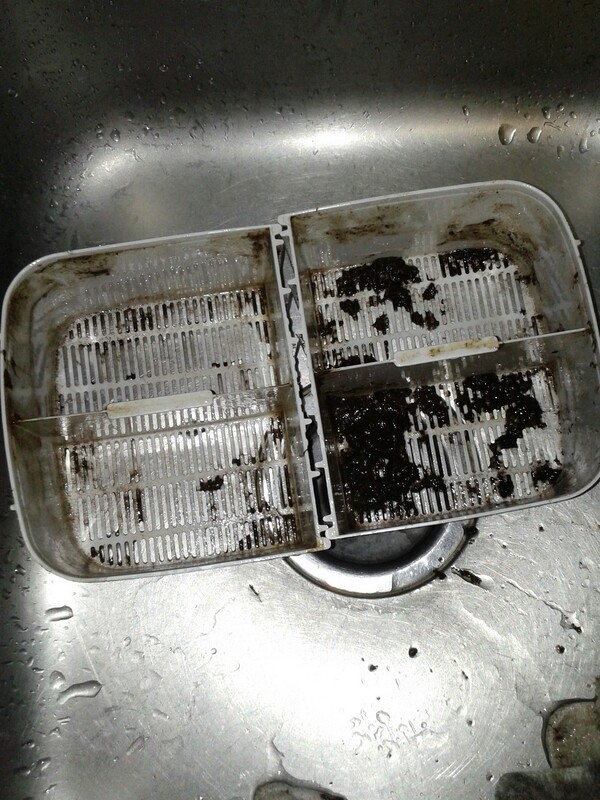 Never clean your canister, parts or filter with running tap water! The chlorination/fluoridation will kill the good bacteria growth that you are trying so hard to maintain. 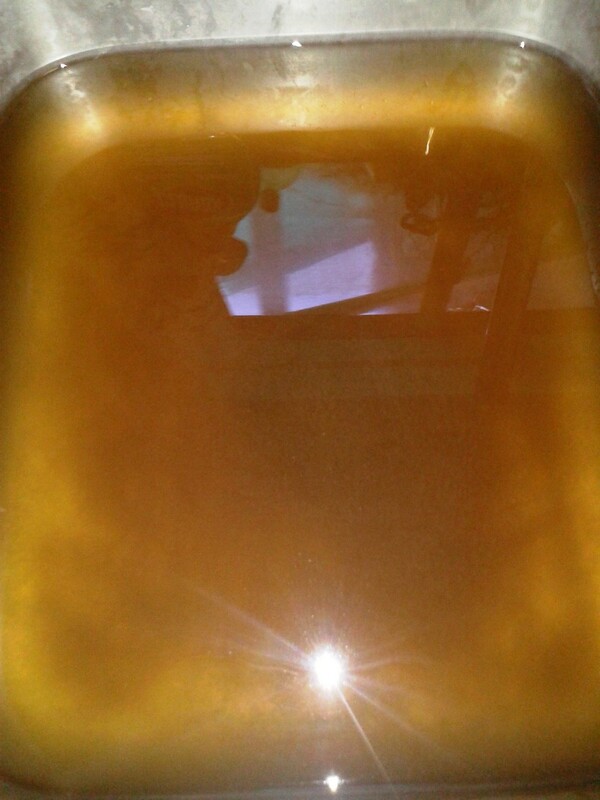 Always clean all parts in tank water that you have drawn off for replacement. 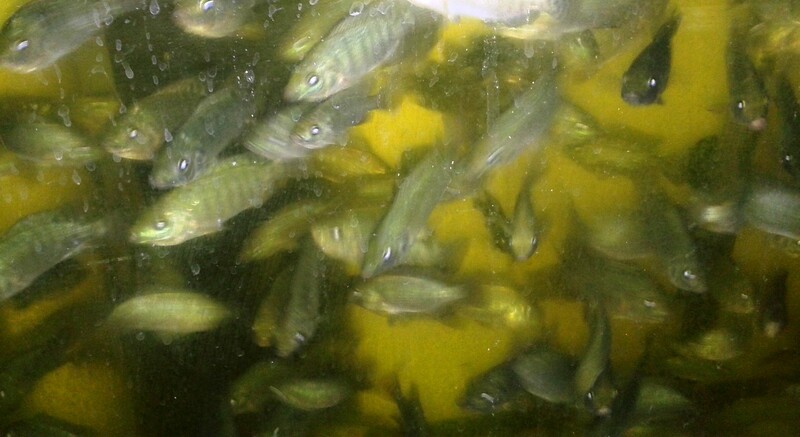 Fingerlings over-loaded in tank before I split into several tanks. Since every few days to once a week, you should be drawing off and replacing 25% of your tank water. How often depends on how many fish you have in a tank. 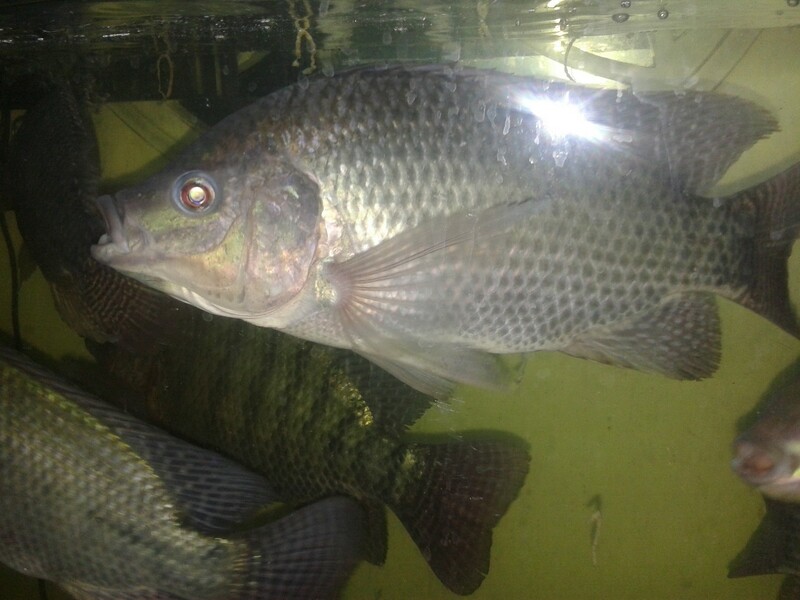 Rule of thumb is about 5 gal per adult tilapia, so a 55 gallon tank should have no more than 11 adult fish. From fingerlings to 4″ you can easily triple that number, but as they get to 4″ and above be ready to move those fish to your aquaponics set-up, another tank, or sell them. I start by “vacuuming” sediment from tank, leaving filter on to help get some of the sediment that I stir up. I only draw off about 1 gallon doing this, but this gallon is discarded since it will be full of solids. After that first gallon, I draw off a full 4 gallon bucket, which I will move to the sink to use for the filter. It will normally take two to three 4 gallon buckets of tank water to thoroughly clean the filter. Sometimes I can clean it with less, but on a 55 gallon tank, replacing 25% is 12.5 gallons anyway. Let me note here, that I always have a 5 gallon bucket of fresh De-chlorinated water to replace as I draw off. I do this to maintain a high water lever during the process, so I don’t have to cool and remove my heater. Since I started doing this, I have never burned up a tank heater! I pour about half the 4 gallon bucket into a stopped sink and start taking filter apart. 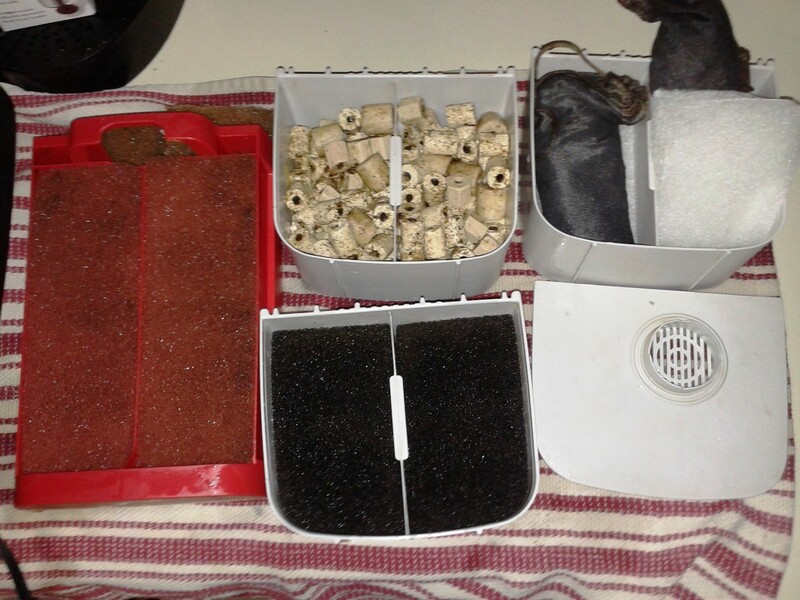 I first wash all the hard plastic parts and set them on a towel while I am dealing with the different filter media. When all of the hard plastic pieces are done, I drain water and pour the remainder of the 4 gallon bucket into the stopped sink. I pour in the bio-media to rinse and clean first. You do not want to scrub these bio-balls or ceramics, as they are the main carrier of the advantageous bacteria for your tank. Just rinse in the sink of tank water and replace into clean container. Water after the third time of squeezing sediment out of foam. The last things I clean are the foam filter media. This is because these will take two to four sinks of water to get out the sediment that has been trapped in the foam. 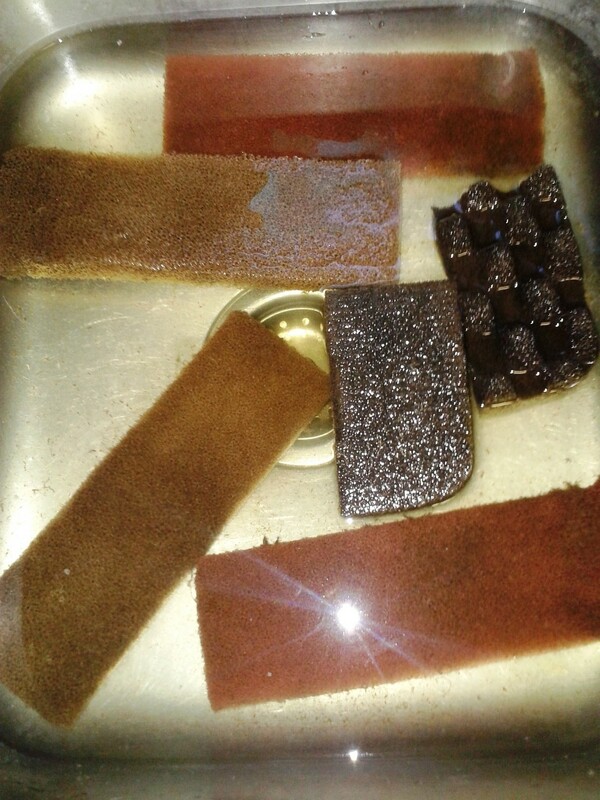 I will rub and squeeze these foam pieces several times until the water turns almost black, then change the water and repeat. This must be done several times until the water remains almost clear after squeezing the foam. Remember, as you draw each 4 gallon bucket from the tank, replace the water in the tank with fresh De-chlorinated water. The last thing you must do is to clean the water transport tubes. Although I said, “Never clean parts in tap-water” I have not found a good way to clean the water flow tubes in the tank water. I do use running tap water to clean the tubes themselves. 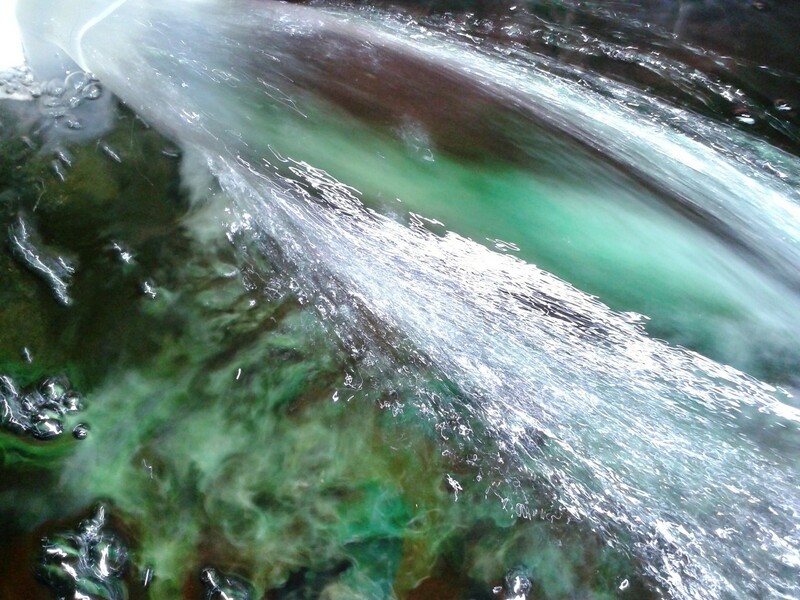 The water pickup tube and discharge nozzle can be removed to clean in the tank water. Before putting filter back together, I always determine whether I need to replace any media. I am not sure what the recommendations are for the different medias, but I have found proper cleaning and maintenance stretches the life of all filter material. I do replace the carbon and water polishing pad (pad the carbon media bag lays on) every 30 days. I find that this helps keep crystal clear water ongoing in my tanks. It has been almost a year and I have not had to replace any of the other media material, as there is no breakdown of material and cleaning it regularly keeps it in good shape. that there are no water pockets when you turn on the filter. If you have done everything well, you should get a very strong water stream across the top of your tank as soon as you plug the system in. I hope this helps some with those of you that are struggling to keep a clear tank or are constantly cleaning the filter. 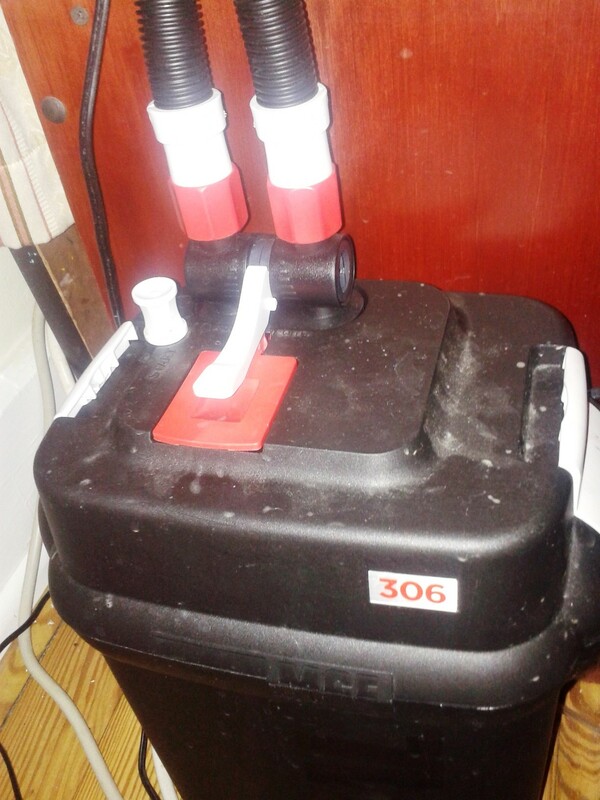 A properly maintained filter and tank should be able to easily last 30 days in between cleaning.